The Ultimate Lean Monster Maker! Mutant Mass was developed over 2 years of research and is based on sound, proven science. More importantly though, the finished Mutant Mass formula was also tested in the gym, where it was put through its paces by real life bodybuilders and strength athletes. Mutant Mass is all about gaining rock hard muscle - and lots of it! Building muscle requires the right protein mix to expand the muscle tissue and repair it fast. The protein must also be spared from being wasted for the body's energy needs, while the muscle also requires massive infusions of clean calories to replace glycogen used up during training. 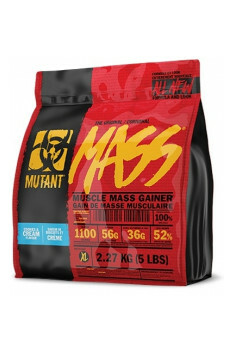 Digestion, absorption, triggering calorie up take and manipulating protein sequencing - the Mutant Mass formula takes all that into account and hits a home run like nothing else you've ever tried! Iso-Stack 10 (The Ultimate Protein Mix) - Our award winning blend of 10 superior, muscle building proteins - no wimp proteins like soy, wheat or other veggie protein - just pure, high BV/PER amino acid proteins proven to build lean tissue. Clean Carb (Lower GI Carbohydrate Mix) - Features our higher 3-fiber blend of low sugar carbs, stacked with our exclusive high molecular weight, sugar free Vextragofor vastly improved glycogen loading. Intrasorb (Calorie uptake Augmentation Mix) - The superior muscle activation proprietary matrix. 5 Ingredients that trigger massive absorption, fuller utilization and complete muscle uptake of these powerful high calorie nutrients, unleashing faster gains in lean body mass than you ever thought possible. PVL is a manufacturer of high-quality supplements for athletes. Among the company's products you can find supplements for improving resoults achieved during training, for example, protein supplements, supplements containing BCAAs, L-carnitine, creatine, weight gainer and isotonic drinks. Waxy Mize (corn starch), maltodextrin, whey protein concentrate, protein mix (whey protein concentrate, milk protein concentrate, milk protein isolate, micellar casein, calcium caseinate, whey protein hydrolyzate, whey protein hydrolyzate, modified milk components, egg albumin), thickener: defatted soy, coconut oil MTC (coconut oil, solid corn syrup, sodium caseinate, dipotassium phosphate, emulsifier: mono and diglycerides, anti-caking agent: silicon dioxide, preservative: sulfur dioxide E220, dextrose (monohydrate), waxy starch barley (contains gluten), glutamine peptide (from wheat protein, contains gluten), red beet powder, thickener: guar gum and / or xanthan gum, sunflower oil, fructose, vanillin, natural and artificial flavors, sweeteners: sucralose E955 ( 135mg / 260g), cinnamon powder, cinnamon extract (CINNULIN PF BRAND) , inulin, powdered flaxseed, colostrum, powdered oatmeal, emulsifier: soya lecithin.